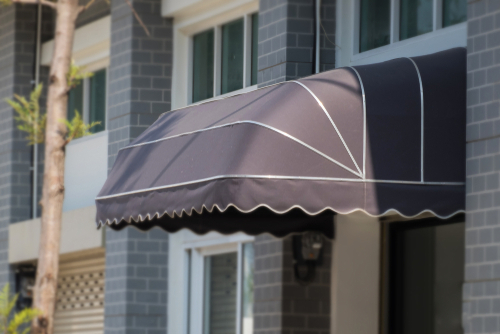 Awnings are the perfect sunscreen for your patio or balcony. There are different types of awnings. Choose between classic patio awnings such as articulated arm, cassette or semi-cassette awning. In addition, markise24.The offers you more types of awnings with side, vertical, drop arm and conservatory awnings as well as marquises. 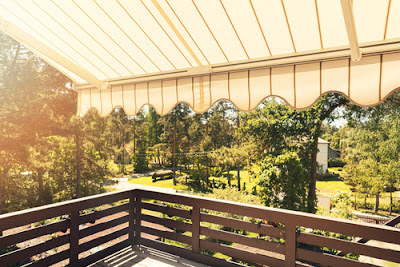 The articulated awning is the most popular awning and is most often used on terraces and balconies. It provides the ideal sun protection as well as a protection against light rain. 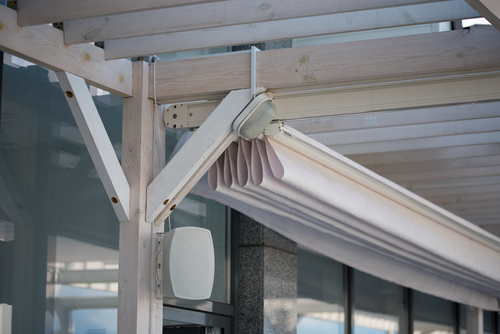 In this type of awning, the two articulated arms pull the awning fabric away from the so-called roller-shaft. 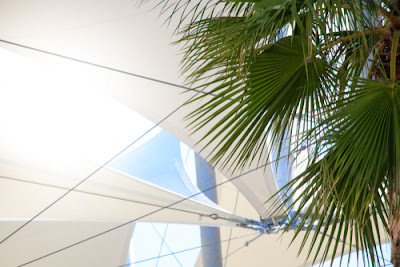 The articulated arm awning floats freely over the terrace. Like the articulated arm awning, the cassette awning also has articulated arm technology. Nevertheless, this type of awning has a decisive advantage: When retracting the complete awning is covered by the cassette and thus serves as the best protection against dirt, rain and wind . Another form of cassette awning is the half-cassette awning (also called sleeve awning). While both the fabric and the articulated arms are fully protected in the cassette awning, in the semi-cassette awning just the awning fabric protected . The articulated arms remain open at the bottom. The side awning is suitable as a modern sight, sun and wind protection for terraces as well as balconies. Side awnings are mounted on the house facade and on the ground. This allows the awning to be removed if necessary. Side awnings are also often used by restaurants. The vertical awning (also called vertical awning) is a special form of the awning. It is suitable as sun and visual protection for window fronts and are mounted like shutters over the window. The effective absorption of solar radiation does not heat interiors when the vertical awnings are shut down but maintain a constant temperature. Vertical awnings are usually chosen as a design element for house facades. The perfect sun protection for windows and small balconies : Drop arm awnings provide for shady places and counteract overheated indoor spaces. With the flexible angle bracket, you can choose how much shade to donate. It also allows you to determine how much visibility you allow outward. Drop arm awnings are often used as eye- catchers. The Markisolette is a mix of vertical and drop arm awning and thus also suitable for large window fronts . The upper part of the awning moves vertically downwards, thus ensuring ideal visibility and sun protection. The lower part of the awning is raised by an arm technique, whereby the angle is flexibly adjustable. This awning part then runs obliquely forward like a drop arm awning. So you do not have to give up effective daylight with an effective glare protection. For conservatories, there are special awnings that are tailored to horizontal, sloping glass roofs . These are mounted from the outside and have an electric drive. Thus, the conservatory can be darkened by pressing a button and the heating of the winter garden in the summer is prevented. Which awnings for which requirements? 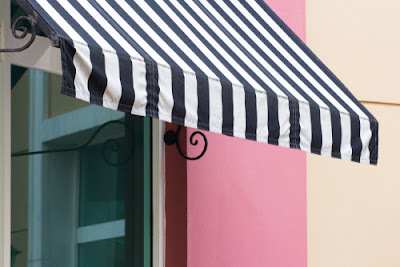 Our awning guide will help! 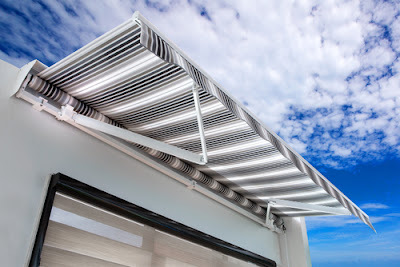 An awning is an indispensable part of all terraces and balconies that are exposed to the sun. Not only so that you can stay outside on hot and sunny days, but also to protect your interiors from overheating, an awning is a worthwhile investment. A cassette awning, in which the awning cloth and articulated arm are optimally protected against the effects of the weather, is ideal if, for example, you attach great importance to a long service life. A window or vertical awning is the right choice for you if you want to protect your terrace or your balcony from outside view or your windows from direct sunlight. For the roofing and shading of larger areas, however, a stable pergola awning, which can be adapted to a wide variety of construction situations, is the optimum solution. Most of the homeowners are not getting conscious and worried about the cost of energy that is required to pay and also for conserving it. In order to improve the efficiency of any home, putting or say, installing home awnings can be one of the best moves. Every consumer is now becoming more and more aware of the energy that he/she is using. A lot of homeowners are concerned about the efficiency of the energy that they are using on a daily basis in their homes. Conserving energy is good for the environment as well as for the home budget of the owner. Usually one will use the word awning about a roof-like cover extending over or in front of a window utilizing protection from the sun or rain. One needs to choose the color, style, and pattern of the awnings by the exterior of the building. Protection from sun, rain, and snow is the prime reason for installing awning at home. 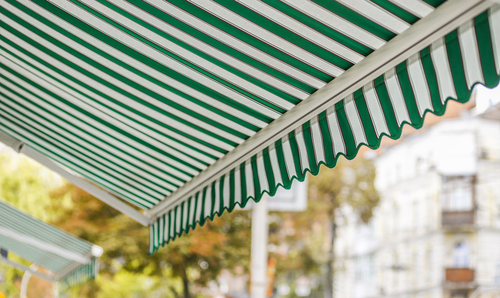 While purchasing, make sure the materials used in your awning can protect you from heat and rain. The result of installing awnings should be reflected in the power bill. A good awning can save 100 hours of energy consumption per month. However, you need to plan and install the awnings properly so that the system provides you with adequate heat protection. The awning should look nice on the walls; that's perhaps the most important quality of an awning. Consult a designer or architect and make sure to know what color combination and style would look aesthetically correct on the walls of your home. This is a quality all consumers look at whatever they use! To make utmost use of the awning, go for retractable ones. They can be pulled back when the weather is harsh, and thus you can ensure a longer life of your awning. With soaring price rates, commercial houses and businesses have to spend a lot on overheads and miscellaneous accounts. Businesses are also experiencing the problem of high energy cost. Installing awning can fetch them the monetary benefit as well. So here again sun control and power saving play the vital role. If you are homeowner or condominium owner that is part of an association, always check to make sure that installing an awning will not violate association rules or bylaws. You may have to request permission in writing and provide exact details of fabric color, size and the manner in which it will be installed. However, most delicate quality of commercial awnings is brand-compliance. All businesses have a brand color, brand logo, and brand style. The awnings should be in line with these factors. Top of that, all the businesses have discrete themes, like health care, shopping mall, restaurant, bookstore, drugstore, coffee shop, etc. So the awning should go with the theme of the business as well. Otherwise, the shades would not look good and damage both the outlook of the building and the image of the business. The different types of awnings possible on the market include those awnings made to cover up an entire patio or just the regular types that are used to keep the sun out of the window. You can get awnings in all shapes and sizes. A typical type of awning is the one you can have in-between a wall, and your garden, an awning of this type will typically expand your house into your garden, and lighting makes a great opportunity. If you combine your awning with a heating lamp you can sit outside at night in colder countries; if you, on the other hand, are situated in a warm country your awning may provide good sun protection while enjoying your midday coffee. The stylish thing to do if you are very price sensitive to purchasing your awnings is to make a list of distributors in your local vicinity. Often local carpenters have a deal with a manufacturer, or you can stop by your local hardware store to get help there. It will often be useful to check the Internet for web-based awning stores, which there is quite the abundance of. 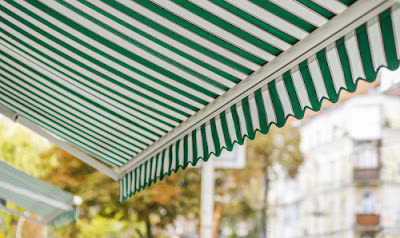 Installing awnings can often be difficult if you are not experienced at performing such tasks. A good strategy here is to offer to pay what they want for the awning if they are willing to install it for free. Usually, they will not accept such a trade, but you will be on the good way to get your awnings at a fair price. 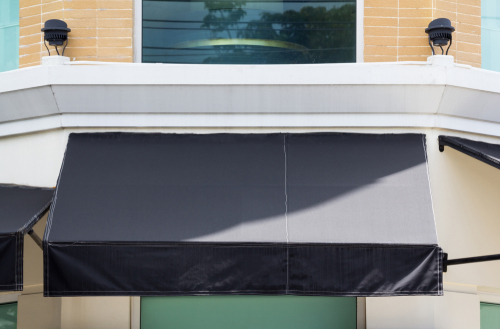 Awning manufacturers now offer a wide variety of fabrics and colors that go into their products. It is best to choose a high-quality grade of fabric. The difference in price between high and low-quality fabrics does not justify investing in a cheaper fabric grade. As with most consumer items, the adage "you get what you pay for" rings true here as well. Metal frames should come with lifetime warranties. Be sure to choose a color for your awning that will suitably match the exterior of your home. When deciding on the company that will install your new awning, a little research and due diligence will go a long way in making the job easier. It is suggested that you look for a company that is an active member of the Professional Awning Manufacturers Association. Ask for references, and if possible, visit homes that have had awnings installed by the provider you are considering. Most reputable firms will keep a photographic portfolio of the work they have done in the past. Talk to the homeowners to get personal feedback about their experiences with the company you are interviewing. If you plan on installing your awning yourself, be sure to have a backup installation plan just in case your good efforts do not produce the results that you previously anticipated.